My present workhorse antenna is a sky loop antenna with a 635 feet perimeter. What exactly is a sky loop antenna? The traditional definition from ham radio circles is that it is a full wave loop antenna, oriented in the horizontal plane. They are often used on 160 and 80 meters. The length or perimeter of a full wave loop antenna is 1005 feet divided by the frequency in MHz. So for 160 meters, say 1.9 MHz, it would be 1005 / 1.9 = 529 ft. The exact size of the loop may be important if you’re transmitting and want a reasonable SWR. For receiving only, it is not as critical, and the “bigger is better” rule usually applies. I ended up with 635 feet because that is the largest length I could easily install. Reversing the formula to 1005 / length gives you the resonant frequency, 1.58 MHz in my case, which is the top end of the MW band. From my experience, the antenna works great for the upper end of MW, especially the extended band (1610-1700), adequate for the middle of the MW band, and it produces very weak signals at the lower end of the MW band. I’ve yet to hear any transatlantic longwave stations with it. 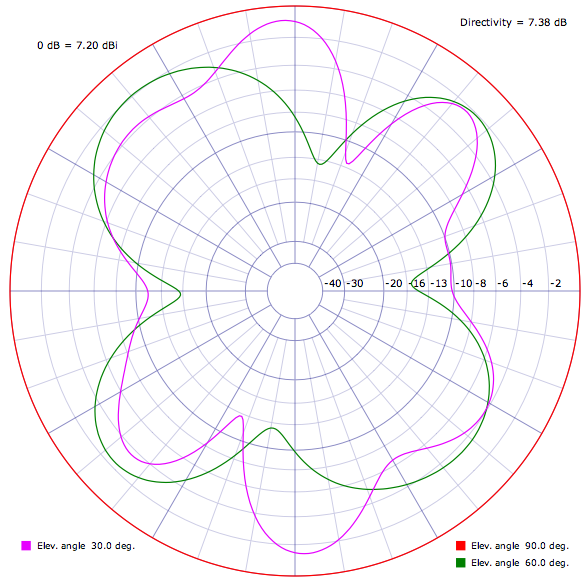 The gain of a loop antenna is proportional to the area. While I don’t have enough space to substantially increase the perimeter of the antenna, I could add perhaps 200 feet at the most. An additional 200 feet would drop the resonant frequency to 1.2 MHz, but I’d substantially increase the area, so it may be a worthwhile project. The height of the antenna varies dramatically, with some points barely 15 ft above the ground, others are around 40 ft. Again, this was what I could easily achieve. Raising sections of the antenna is a planned Spring project, it will be interesting to see what the improvement, if any, is. The antenna is constructed from #16 insulated stranded wire, and is suspected from trees around the yard. 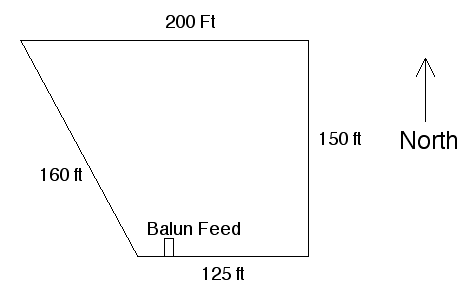 The feedpoint is a 16:1 balun, and 100 feet of 75 ohm RG-6 coax runs from the balun to the shack. I’ve become a big fan of RG-6 coax for my antenna projects. This is the coax used for TV purposes. It’s available everywhere, and is incredibly cheap and low loss. Yes, it is 75 ohm, not 52 ohm, but for receive only antenna like this, who cares? R is the real component of the impedance, X is the reactive, and Z is the overall impedance, all values in ohms. As you can see, the impedance values are all over the place. Looking at them in closer detail would show even finer scale variations, but I’m not sure it would be too useful, as this is a simulation, an estimate of the antenna performance, these are not necessarily the impedance values of the actual antenna. Lies, damned lines, and antenna models. The large Z impedance values over the HF range are why I went with a 16:1 balun, to better match them to the 75 ohm coax. The downside is that the loop impedance over MW is much lower, and the 16:1 balun probably produces a poor match. A 1:1 balun might be best for MW use, but I’m not sure what would happen at HF, I assume a poorer match and weaker signals. I spend most of my time on HF, anyway. Below is a plot showing the gain of the antenna at three different elevation angles, 30 degrees (low angle radiation, ideal for DX), 60 degrees, and 90 degrees (which would be straight up) for a frequency of 6.9 MHz. The red circle is the gain for 90 degrees, straight up. This angle for NVIS, where the radio waves are going virtually straight up from the transmitter, and being reflected straight down back to the Earth. The gain is 7.2 dB over an isotropic antenna (an antenna with no gain in any direction). For this case, the antenna has no favored direction, it is equally sensitive in all directions around the compass. For the lower angles, the antenna does have more gain in certain directions, and of course less in others. I find that for NVIS reception of pirates this antenna is excellent, so here’s one case of an antenna model actually approaching reality. DX reception is not bad either, I regularly pick up Europirates, and of course SWBC stations from all over. One thing I like about the antenna is that it works reasonable well over all of HF and much of MW. I used to have dedicated dipoles for the various HF bands, but it was always a pain to switch antennas when tuning to a different band. And being a loop antenna, the noise levels are much lower than dipoles. I do wish the performance on the lower part of MW was better. I will try enlarging the antenna and see if that improves MW reception. Don’t let the large size of my build of this antenna discourage you from building your own, if you don’t have the room for one of this size. A full wave loop antenna for 6.9 MHz is 146 feet – that’s a square 36 1/2 feet on a side. Such an antenna should work well from 43 meters on up. What’s the Best Time of the Day to Hear a Pirate Station on 43 Meters? The answer to both of those questions depends on solar condition, how far apart the operator and the listener are, and their relative locations. 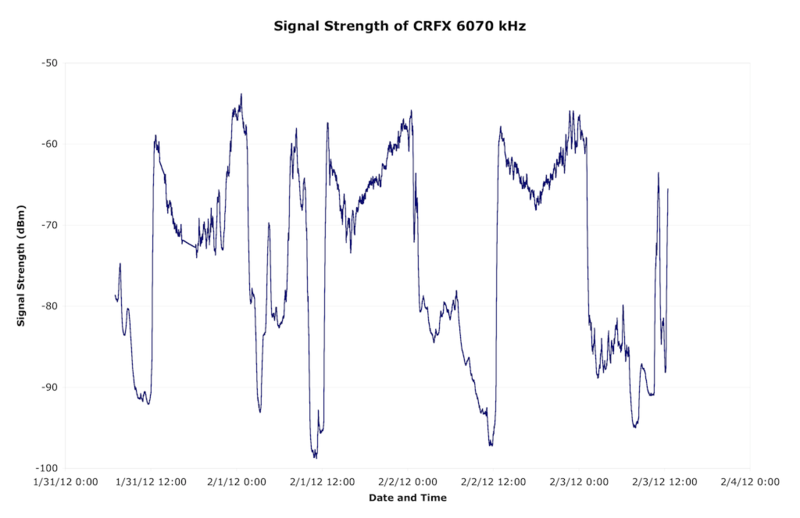 The above graph (click for a larger image) shows the signal level of CFRX, which transmits from Toronto, Ontario on 6070 kHz with 1 kW of power. It is located about 300 miles to the north-north-west of my location. 6070 kHz is close to the 6800-7000 kHz 43 meter pirate band, and the distance is comprable to that of many pirate stations, so I believe it is a good analog for the daily variation of signal strengths that most North American pirate radio stations will experience when operating under NVIS propagation. The data starts at 0700 UTC on January 31, 2012 and runs until 1200 UTC on February 3, 2012. The data was captured with an SDR-14 connected to a 132 ft T2FD antenna. Custom software gathers signal strength data for several specified frequencies. The signal suddenly drops to a lower level. It stays at that lower level for a while, with a slight decrease in signal over that time. The signal then starts dropping more quickly over the rest of the night, reaching a minimum just before sunrise. Likewise, at about 1200 UTC each day, the signal strength suddenly increases again. This is when the F2 layer ionization has increased to the point where NVIS propagation is again possible. Sometimes there is an increase in signal level earlier than this. The morning of February 1, for example, the signal came up during the middle of the night for several hours, then went back down again. That was a fairly unusual night, propagation-wise, compared to the other nights. First, the distance between the listener and the station (and their relative locations, of course). The closer together, the steeper the angle of incidence radio waves to the ionosphere, and the earlier in the evening (and later in the morning) the station will go long. Stations further away will go long later and return earlier, because the radio waves hit the ionosphere at a more shallow angle. The time of day is also dependent on the longitudes of the two stations, the further west they are, the later in the UTC day it will be, due to the location of the Sun over the Earth. Second, the frequency used. The higher the frequency, the earlier the ionosphere will stop supporting NVIS, and the longer it will take in the morning for the ionization levels to return to a sufficient level to support it again. Third, the day of the year. We’re in winter now, with relatively short days and long nights. As we get closer to spring and summer, the days get longer, and the band will be open for NVIS longer. Fourth, the solar activity, which affects how strongly ionized the F2 layer gets. This also affects the D layer, which can attenuate signals, which we’ll get to in a moment. Changes in solar activity produce some of the day to day variations in CFRX signal strength patterns in the graph. Geomagnetic variations probably account for variations as well. These of course are due in large part to previous solar events, such as flares. Next, note that while the signal level does suddenly increase in the morning, it then starts to decrease again, bottoming out around 1700 UTC, which is local noon. This is due to the attenuating effect of the D layer of the ionosphere. The D layer absorbs radio waves, rather than reflecting them back to Earth. The stronger the D layer, the more absorption there is. Lower frequencies are also more strongly absorbed. This attenuation peaks at local noon, when the Sun is highest in the sky. The drop in signal level at noon is around 12 dB, or 2 S units. So while the Sun strengthens the F layer which supports propagation, it also strengthens the D layer, which attenuates it. These are competing factors. X-Rays from the Sun increase the D layer absorption. The background X-Ray flux is a good indicator of how strong (relatively) the D layer is. Solar flares can cause dramatic increases in D layer ionization, leading to severe fading and even shortwave blackouts. Another thing to note is that the signal level in the morning is not as strong for as long as it is in the evening. After noon, the D layer starts to weaken when the ions begin to recombine. The F layer also weakens, but this takes longer to occur. So in late afternoon and early evening, we have an extremely weak D layer, yet still have a fairly good F layer, giving us strong signal levels. Then, finally, the F layer weakens to the point where NVIS operation is no longer possible, and the band goes long, sometimes dramatically. We can use CFRX’s known 1 kW transmitter power and estimate the received signal levels if they were using a lower power level, typical with pirates. A 100 watt transmitter will be produce signal levels 10 dB weaker than CFRX’s 1 kW. Likewise, a 10 watt transmitter will be 20 dB weaker. For these measurements I used an SDR-14 receiver and a 132 ft T2FD antenna. Listeners with more modest setups are going to have a weaker signal. Using the February 1st data, CFRX had a signal of about -60 dBm at 1300 UTC. This is S9+13 dB. A 100 watt transmitter would produce a signal of about -70 dBm, or just over S9. A 10 watt transmitter would produce a -80 dBm signal, about S8. At high noon, CFRX was about -70 dBm, or very close to S9. A 100 watt transmitter would be -80 dBm, about S8, while a 10 watt transmitter would be -90 dBm, or about S6. At around 0000 UTC, CFRX was about -56 dBm. A 100 watt transmitter would be -66 dBm, or S9+7 dB. A 10 watt transmitter would produce a signal of -76 dBm, about halfway between an S8 and S9 signal. After the band went long, but while CFRX was still audible, the signal was about -80 dBm. A 100 watt transmitter would be -90 dBm, or about S6. A 10 watt transmitter would be about -100 dBm, or midway between S4 and S5. Noise levels on this band are about -105 dBm, so the signal to noise ratio (SNR) of the 100 watt station would be only about 10 dB, not very good. For the 10 watt station, it would be 0 dB, meaning that you would not be likely to hear much of anything. NVIS propagation, which most pirates are using on 43 meters, is presently most effective in the late afternoon and early evening. As we move into summer this will probably shift somewhat later, I’ll have to run some more measurements in several months to see what actually happens. NVIS is also fairly good in the morning, but signal levels will likely be weaker than in the day. I’ve often noticed this myself: Radio Ga Ga is usually very weak here in the morning, but comes in much better in the early evening. Signal levels from NVIS will likely be weaker around noon, due to the stronger D layer. Propagation is still quite possible, of course, and signal levels may be good, especially for shorter distances and higher power levels. You’re going to have a difficult time reaching the east coast of the US from Montana with a 10 watt grenade at high noon on 43 meters, however. Signal levels at night for stations trying to use NVIS propagation will be extremely weak, if the station is even audible at all. Note that this is only the case for stations that are close to the listener. The further away the station is, the more shallow the incidence angle of the radio waves and the ionosphere. This means that the station will go long later in the evening, or not at all. Likewise, an operator trying to get out further, or a listener trying to hear more distant stations, will want to try later in the evening after the band has gone long (which of course is why we call it going long in the first place). Operators can use the time of the day their transmit to (roughly) control where they will be heard. An operator from Guise Faux’s “southwest corner of Pennsylvania” will reach an audience in a several hundred mile radius during the middle of the day, perhaps slightly further in the morning (after sunrise) or early evening. After the band goes long, say after 0100 UTC right now, he’ll start to reach listeners further away, while local listeners will be in the skip zone. As the evening goes on, the skip zone will continue to grow in radius, but he’ll be reaching listeners further west, and possibly eventually to the west coast. Conditions will change with the seasons and the solar activity level. What is true now will not be true six months from now, when we’re in summer. A change in solar activity levels will also affect propagation conditions on 43 meters. The NVIS Near Vertical Incident Sky Wave article has the necessary information for estimating when propagation will go long, based on the distance between the stations and the current ionosphere conditions. Operators and listeners may want to take a look at the current conditions to gauge how propagation will be. While not a guaranteed way of computing of exact conditions, it is a good way to get a feel for how the band will perform. Likewise, take a look what solar conditions were like that day, whether there were any major flares, for example.